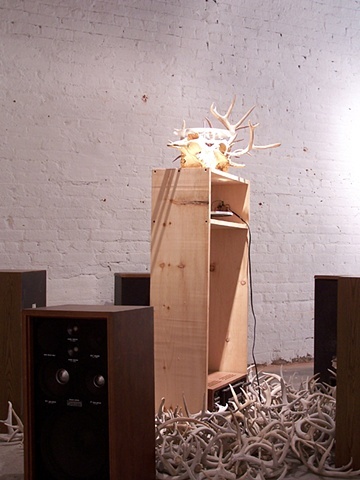 Skull, vinyl, antler, wood, sound, and stereo equipment. This piece is a functioning record player made from a skull modeled after an altar within a witch's protective circle. The experience of selecting a record from amongst many and playing it for personal enjoyment or for others can often be powerful or command attention. When the record is played it projects out from the circle as a trance-like spell.